As demonstrated in Sect. 4.1, the extensive Landsat archive is not suitable to generate neither a multi-annual nor an Arctic-wide melt pond data set. Because of the comparatively lower resolution and wider swath width of the MODIS sensor, a continuous spatial coverage of the Arctic with satellite data is available. There is however, a downside to the lower resolution. Given, that one MODIS pixel represents an area of 250 m ×250 m, it must be assumed that each pixel above sea ice contains more than one surface type. In remote sensing, these pixels are called “mixed pixels”. Since no specific surface type can be assigned to the “mixed pixels”, the two in Chap. 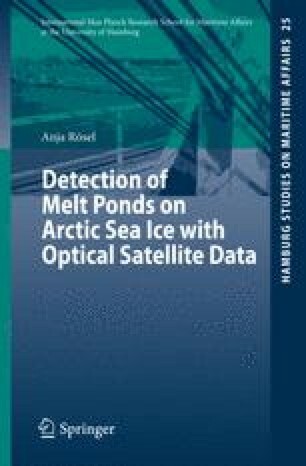 4 described methods for determining melt ponds from Landsat data are not applicable on MODIS data. Therefore, another approach, which considers these “mixed pixels”, is introduced.